One year ago a Swedish PR agency bombed Belarus with teddy bears to support democracy in the country. Last month, the authorities stated that they had completed an investigation of the incident and closed the criminal investigation. However, the debate of whether this action did more good than harm to Belarusians continues. Some praise the Swedes as heroes while others consider them irresponsible provocateurs pushing Belarus towards Russia. If similar performances will be organised in the future, they must strengthen the position of civil society in Belarus, rather than expose it to the regime and weaken the image of the West in Belarus. On 4 July 2012, agents of the Swedish PR company Studio Total illegally crossed the Belarusian border in a single-engine aircraft. The aircraft bombed Belarus with 800 teddy bears, holding notes in support of democracy. At first the Belarusian Ministry of Defense denied the very fact of illegal border crossing. The regime`s propagandist Vadzim Hihin wrote a long article arguing that the Swedish PR people did not cross the Belarusian border. In response, the Studio Total sent Belarus Digest and other media links to the full video of the teddy bear landing. The authorities had no other choice but to start a criminal case and to recognize that the Belarusian air defense has holes in its system. Military expert Alexander Alesin said that having such holes can be especially dangerous for a country that is building a nuclear power plant. Instead of teddy bears there could have been explosives to be used against nuclear reactor. Although the teddy bear stunt has become a significant event in Belarusian media, the intentions of the Swedish PR people remain unclear. The Swedish company failed to publish, as promised, a report of the cost of the stunt. They also did not name the sponsors of the teddy bear stunt. These facts bring the independence of the Swedes into question. It would be unfair to blame the Swedish PR people in all Belarusian problems when the main blame should lie with the state authorities. However, Total Studio`s actions brought Belarus more harm than good. Lukashenka sacked a head of the Border Committee and the Air Forces. The Belarusian military court sentenced an ensign of the border service to two years in prison for not reporting the crossing of the Swedish aircraft through the Belarusian border. Lukashenka`s regime arrested photographer Suryapin and real estate agent Bashamyrau and placed them in a KGB detention centre, the so-called “amerikanka” and kept them in detention for a month. Suryapin was the first one who took photos of the teddy bears on the ground and Bashamyrau provided housing in Belarus for the Swedish PR people. Also, the Belarusian authorities fully used the teddy bears landing to reinforce its anti-Western rhetoric. The Swedish PR agency has put the Western countries in an uncomfortable situation where the citizens of Sweden violated both national and international law. Thus, the West has become the “bad guy” in bilateral relations. Also, the regime did not extend the accreditation of the Swedish Ambassador to Belarus and closed the Swedish Embassy in Minsk. Belarusians appreciate Stefan Eriksson and for his support of the civil society as well as his perfect command of the Belarusian language. The Swedish Embassy has not resumed its work in Minsk yet. The Estonian embassy performs its visa functions. It seems that Russia used the teddy bear landing to increase the pressure on the Belarusian authorities in the sphere of military integration. Soon, Russia will open a new air base in Lida, a town in western Belarus close to Lithuania from where the Swedes flew in. Was the Action Worth It? The cost of the teddy bear landing to Belarus turned out to be rather high and caused a debate about the appropriateness of such performances among the Belarusian opposition. The Belarusian civil society was divided in their opinion on the teddy bear stunt. The opposition web-site Charter’97 awarded Studio Total a prize for their courage in the human rights struggle in Belarus. But the leader of the Belarusian opposition during the early 90s Zianon Pazniak said that the action brought nothing but harm, and called the Swedes provocateurs. Former editor of influential Belarusian daily “Nasha Niva” Siarhei Dubavets wrote that only Russia benefited from the action. Despite the noise that the action caused in the Belarusian independent media it is difficult to say that it had a significant meaning for the Belarusian society. The reasons remain banal. First, the political apathy of Belarusian society. Secondly, civil society has not created an information tool that would reach all Belarusians. Without the appropriate media design, this action became another dry shot. Will the Teddy Bear Stunt Happen Again? Studio Total promises new performances in support of democracy in Belarus. It seems that not only a handful of PR people, but human rights activists from around the world who will use the World Hockey Championship in Belarus next year in order to draw attention to the problems of political prisoners or the absence of elections in the country. The international media’s attention will focus on Belarus for a short time, so democratic activists will use this opportunity. Western journalists and human rights activists will use this opportunity as well. However, the new actions should be different from the teddy bear landing. The organisers must anticipate the consequences of the action. The police would arrest local Belarusians for the performance rather than the organisers who could enjoy the results of their actions in a safe place, away from the Belarusian security services. Furthermore, any actions should strengthen the position of Belarusian pro-democracy forces rather than weaken them and show Western activists as criminals. Lukashenka`s propaganda machine knows how to exploit tje actions of Western activists and divert the media discourse from human rights violations in the country to provocations of Western citizens. Western activists often find it easier to tease and ridicule Lukashenka and his mates from abroad, rather than implementing projects for Belarusians with lasting consequences going beyond annoying the regime. IISEPS published the latest national opinion poll results. Alexander Lukashenka’s rating is on the rise. The Liberal Club takes a closer look at the public administration reforms. Jana Kobzova notes that the discrepancy in a number of political prisoners in Belarus might be a practical problem for EU policymakers. Results of the National Opinion Poll. June, 2013 – A national survey conducted in June 2013 by Independent Institute of Socio-Economic and Political Studies (IISEPS), shows that the image of the state as the chief spokesman of the people’s interests becomes more and more “dim”. However, these sentiments are not directly transferred to the president. Increasing the “economic well-being” in the second quarter of the year has had a positive impact on the attitude to the president – his electoral rating continues to gradually rise: in December 2012, 31.5% respondents were ready to vote for him, in March – 33.4%; now, in June – 37.3%. What Eastern Europeans Think about the Democratic Transition: Understanding Values and Attitudes – The paper describes current trends based on available public opinion polls in four Eastern European countries (Belarus, Georgia, Moldova and Ukraine) in order to provide deeper analysis of the transition process taking place in these countries. It argues that democratic transition in post-Soviet countries should not be viewed only in terms of changes in the political elite, but also in terms of changes in the attitudes of its citizens. Belarus and the Eurasian Union: Incremental Integration – In a policy brief by Balázs Jarábik, Alexei Pikulik and Andrei Yeliseyeu examines the new integration process which reflects Moscow’s efforts to create a supranational regulatory framework inspired by the EU. However, many obstacles prevail. Belarus, for example, has no interest in pressing for a full-fledged Eurasian Union unless it is on its own terms. While Central Europe and the Baltic states were willing to pay the price of hard reforms to achieve their European dream, Belarus wishes to get paid for Eurasian integration. Counting Belarus’ Political Prisoners – Jana Kobzova gives some attention to the difference in numbers of political prisoners: 9 such people on EEAS’ list; 11 – in Human Rights Centre Viasna list; 5 prisoners of conscience are named in the recent Amnesty International annual report; and 13 political are mentioned by Belarusian news portal Charter97. The expert notes that such a difference in numbers is not just confusing – it might also become a practical problem for European policymakers. How to Arrange Belarus. A Square with Love – Ina Romashevskaya of research project in public administration BIPART comments on the meeting of Prime Minister Mikhail Myasnikovich with the Minsk authorities on the issue of improvement of the capital. The expert believes that the state – in this case, the city authorities – should and can transform its urban space, making it attractive, safe and fun for everyone. Respectively, the government should ask the citizens’ opinion in order to understand what a “cosy” and “attractive” urban space means for them. Public Administration Reform: Policy Documents vs. Presidential Decree – Nikita Belyaev, of the Liberal Club, presented a policy brief on the analysis of the Program of Social and Economic development of Belarus for 2011-2015 and the relevant presidential decrees. One of the findings of the research claims that some decisions taken in the framework of public administration contradict the objectives set out in the policy documents; at the same the presidential decrees have much greater practical force. Belarusian Mobilization as an External Factor – Alexei Gajdukevich, the project “Cytadel”, talks about the purposes and methods of mobilization of Belarusian society. He believes that integration into global processes with positive internal consolidation and protection of the physical, moral and spiritual dangers can become a significant factor for the Belarusian state in foreign policy. In contrast to the decline of Western civilization, the expert sees some positive processes in Belarus, which may lead to more opportunities for Belarusian expansion in the world. Economy on the Fingers – a regular program of TV TUT.by discusses the strike of entrepreneurs, the introduction of “platinum action” and the legal side of unloading warehouses. The experts of the program – the economist Sergei Chaly and the lawyer Maxim Znak – come to ambiguous conclusions, in particular, that individual entrepreneurs are at a dead end in the evolution of corporate law. Also, Gazeta.ru identifies the main feature of the current protests, namely, for the first time Belarusian entrepreneurs have put forward political demands and starting to collect signatures for the exit of Belarus from the Customs Union. The State Needs Young Experts. But Why? – this week TV TUT.by program “Amplituda” is dedicated to young people’s participation in analytics and the state demand for young intellectuals. The invited experts – Alexei Matsevilo, Information Analysis Centre under the Administration of President; Yauheni Preiherman, of the Liberal Club NGO; and Alexander Shpakovsky, of project “Cytadel” – discuss the challenges and guarantees that the project would not become analytical support to add to the legitimacy of government decisions already made. LGBT Topic in Belarusian Media – Mediakritika.by analyses the results of the annual Report on coverage of LGBT issues in Belarusian media. 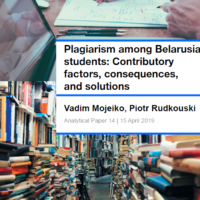 In particular, monthly Belarusian media publishes about 1.6 related articles; about 61% of the materials contain a neutral evaluation, about 26% – positive, and 12% – negative. It is noteworthy that the state-run media are showing a more aggressive approach in covering the LGBT topic while independent editions demonstrate neutral or positive modality.